Daily 9:00 a.m. – 5:00 p.m.
Nestled about 60 miles south of Washington, D.C. near Fredericksburg, Virginia is the Wilderness Presidential Resort, a privately-owned, family-oriented camp ground retreat with more than 600 acres of beautiful forests and waterways. 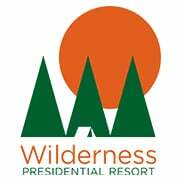 Wilderness Presidential Resort Adventure Park is open 365 days a year and offers a variety of lodging and recreation activity for people of all ages and abilities, the perfect getaway for any group of people. At Wilderness Presidential Resort you will find a variety of lodging options for any size group. Options vary from tent site rentals for those who like to bring their own to our cabin rentals for those who prefer amenities. Camp Cottages: These beautiful, cozy wooden lakefront units are the newest addition to the Wilderness Presidential Resort, opened fall 2018, and feature heat and air conditioning, kitchenette, porch, bathroom with shower, internet and cable TV. Each with sleeping accommodations for up to six people. RVs: These 28- and 38-foot park model RVs are pet-friendly and include air conditioning, a small, stocked kitchen and full bathroom. Each with sleeping accommodations for up to 6 people. Log Cabins: These rustic log cabins include a porch with chairs, two bedrooms and two bathrooms, a full kitchen, living area with fireplace, TV and seating, internet and cable TV. RV and Tent Sites: For advanced campers park your RV or set up a tent on one of our many sites. All RV sites offer 30 amp electric service and water. Sewer pumping services are available upon request for additional fee. At Wilderness Presidential Resort, we want you and your family to have a great time during your stay. That’s why we created dozens of activities and events to keep you entertained while camping, including walking trails, tennis, racquetball, disc golf, miniature golf, pool parties and campfires. Our Adventure Park features high ropes course and a climbing wall for any beginner or advanced outdoors person, and our gymnasium features treadmills, a basketball/volleyball court, board games, ping pong tables and air hockey. Wilderness Presidential Resort has two lakes, Cool Spring Lake and Hazel Grove, and the marina is open May through September for boat and paddle boat rentals. Both lakes are stocked with fish, such as largemouth bass, chain pickerel, channel catfish, crappie, bluegills and carp. While our staff provides you and your family the hospitality needed to relax while away from home, we encourage you to visit nearby Frederiksberg, Richmond and Washington, D.C. Explore the Civil War history at four battlefields: Fredericksburg, Chancellorsville, The Wilderness and Spotsylvania Court House. Walking tours are guided by park historians are available. Other attractions include: Historic Kenmore & George Washington’s Ferry Farm, Rising Sun Tavern, James Madison’s Montpelier, George Washington’s Mount Vernon and Thomas Jefferson’s Monticello. Get better results and attract more visitors! Our enhanced business listing option gives you great results for very little cost. With this type of listing, you get more exposure than a free listing, and can begin adding some content to your business profile. If you want to upload more content and maximize your exposure, try our Premium Listing service. Your business listing near the top of our site's search results (beneath Premium Listings). Create a description of your business to tell customers more about you. One photo of your business or product. One offer/coupon (to promote a deal or an upcoming sale, etc.). Your business will appear in our Featured Listings widget on the front of the Business Directory section. Your business logo will be featured on your business profile, search results and on the Featured Listings widget. A star badge to highlight your listing on search results and on the Featured Listings widget. Manage and control your listing through your user dashboard. Maximize your exposure and SEO! By upgrading to a Premium listing, you can start your own business blog, upload photos, and control the content and display of your premium business profile! Posting relevant, expert advice about your business helps drive traffic to your Web site, highlights you as an expert in your field, and really fires up your SEO (Search Engine Optimization). You are free to post press releases, advice columns, product announcements, information about upcoming sales, and more! Your business listing near the top of our site's search results. Up to ten offers (to promote coupons, upcoming sales, etc.). Integration with and promotion of your existing Facebook and Twitter profiles. Business logo will be featured on your business profile, search results, Featured Listings widget, and the Front Page widget.